This month we’re looking at the work of Aspire user Terry Jones, a registered Nurse of 31 years who retired for the first time in 2005 and opened his own business in furniture design, antique restoration, refinishing, and reproductions. I was a one-person shop and found that I could increase production and aid in restoration by purchasing a shopbot. I acquired a used PRT 48×96. My wife and I found this machine in Chapel Hill, NC which was near the shopbot manufacturer. We took some classes and bought my first software package of Aspire 2.5. When the economy tanked in 2009, I closed the doors on my shop and started travel nursing. Despite closing the doors to his shop and taking Nursing backup, Terry didn’t give up on his passion for CNC. Instead he utilized his travelling to seek out fellow enthusiasts and build on his knowledge of CNC through the community. Terry is a real supporter of Vectric software and for the last two years has even taught students how to use vcarve Pro and shopbot at a local Maker Space. When teaching, it’s so exciting to see the lights come on in the students’ eyes and the gears rolling as they are expressing, “I can do this project now I have been wanting to do for a long time“. The real incentive for Terry to start using a CNC was the effect on his furniture business. Terry found that CNC enhanced his product quality and workflow efficiency which definitely had a positive knock on effect…. I found 3d models carved with a CNC really increased my profit margins. A cabinet cut out with a CNC machine reduced waste, optimized time and fit of construction immediately became the tightest tolerances. Now I could nest parts, machine dados, rabbits, and pocket screw hole and only touching the sheet of plywood once in the complete cutting phase. I own a shopbot PRT 48×96 with a 4G upgrade, four zoned regen blower vacuum table. It has a Colombo 220V spindle attached to VFD, second z with a Makita router and the machine is connected to a 2HP dust collector with remote on/off clip-on switch. Also, about two months ago, I purchased a 500mm x 500mm X Carve by Inventables. This is equipped with a Dewalt 611 router. I added a Suckit dust shoe for this router connected to a wall mounted dust collector. This sits on a homemade drawer to pull out of the basement of my 5th wheel RV. This sits under a 4’ 2 tube LED shop light which is very bright. Terry was first introduced to Vectric software through shopbot in North Carolina back in 2007 when he purchased Aspire 2.5 He has since continued to upgrade throughout the various versions and is currently using Aspire 8.5. I liked each of the upgrades but still have a lot to learn. Although I do own Photo V Carve, Cabinet Parts Pro, and Free Doors. I do not use these much anymore as with Aspire, there is no need for any other design software. The combination of the Aspire features are so seamless together. Especially after importing models, you are able to edit, join, sculpt, blend models to fit together and adjust each to different elevations for the perfect fit. What is most helpful is the ability to preview the tool paths before you place the stock on the machine. This saves time, costs of bit and material mishaps and of course a perfect end product for better financial return and a larger customer base. I use Aspire not only for an avenue to CNC, but also use the CAD features to design and build everything outside CAM. In my classes, the majority of my students (mathematicians, engineers and designers) find that they do not need any other design or architecture CAD software after my class is over. This software does everything. Whilst working as a travelling nurse Terry took advantage of the opportunity to learn from the community around him, experimenting with a multitude of different mediums and as many different designs. The project Terry is showcasing in this case study is a model of a pizza oven made out of a high-density EPS yellow insulation foam. I acquired a pallet of 2’ x 8’ x 2” foam which enables me to cut a great number of projects. 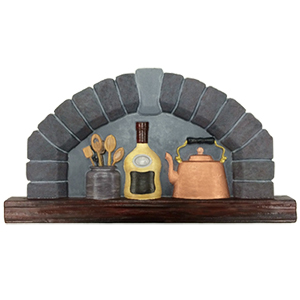 I found this lovely model of a stone brick pizza oven. 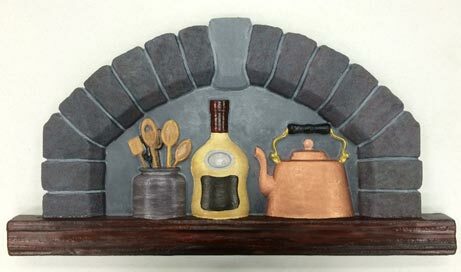 I Inserted a tea kettle, a pre-prohibition liquor bottle and a crock of cooking utensils. This finished project now hangs on one of the walls near my bar in the den. I began using acrylic paints after using an exterior water base house paint as a primer. Each one of the stones that made up the pizza oven required 9 different colours to achieve the stone look. The rest of the painting then followed with all of the other features. Looking back at the project Terry admits admiring the finished piece was the most satisfying. The most enjoyable part of the whole project for me was finishing the painting at the end of the project to be able to step back and admire the entire project and how I got there using Vectric Aspire. Plan the sequence of the tool paths to a proper order. Name each tool path specifically for the job it will perform and number it pertaining to the sequence. Review the preview tool path in all perspectives and zoom in to assess for defects or mistakes before taking the files to the CNC. It will save on frustration and potential damages to the CNC and the stock. What you see on the preview is exactly what you will produce on the machine. I love it! Terry is working towards his final retirement plan which, if everything goes to plan will see him being able to create anything from art and furniture to high-end custom kayaks. With Aspire 8.5, I am turning out some awesome art. I am going to increase the number of small samples with the X Carve to get ready for retirement in the future. As a final comment, I would like to thank Vectric for their superior tutorials making all Vectric products user friendly, and especially for the forum for the networking and educational incite from its members. Shopbot, for such a remarkable machine and the best customer support for their CNC. Shopbot also has a super forum and the combination of Aspire and V Carve Pro tutorials in coordination with the shopbot from TJ is also helpful to all..
It’s evident from this article that Terry likes to work on a wide variety of projects, which is testament to his creative flair and skill using the software and the CNC. We would like to take this opportunity to thank Terry for taking the time out to write up this article and sharing his excellent work with us and we look forward to seeing more of his finished projects in the future.